AWP Panel: Cynthia Bond, me, Celeste Gainey, Cynthia Young. Sandra Lambert not shown. At Busboys and Poets, Washington, D.C.
September 6 - 8, 2019, Workshop - "In it for the long haul: writing the novel"
March 2016 - Author talk and reading, Washington, D.C.
June 2014: Forbes Library Writing Room Reading, Northampton. March 2011: The Bookstore, Lenox, MA. 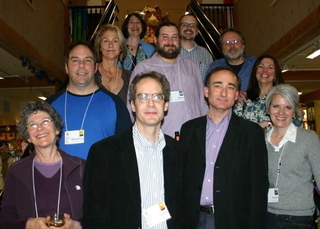 February 2011: San Miguel Writers Conference, Mexico. February 2011: Odyssey Bookshop, South Hadley, MA. February 2011: Busboys and Poets, Washington, D.C.
February 2011: The Big Hunt, Washington, D.C.
October 2010: WriteAngles25, South Hadley, MA.